Provide comfort for the family of Lou Carmean with a meaningful gesture of sympathy. Lou Ann Carmean, 84, a loving woman who lived with gusto despite lifelong health complications, died peacefully on April 13, 2019 at home in Independence, Missouri, with her grateful family at her side. Lou Ann was born on May 13, 1934 in San Marcos, Texas, where she learned to swim in the beautiful San Marcos River and became an accomplished roller skater who zipped around the rink in Austin in outfits sewed by her mother. She loved to read and, as an adult, she read a book a day and the local newspaper—and any other newspaper she could get her hands on. Working the newspaper crossword puzzle was a daily ritual of delight. Lou Ann was always up for a game of Scrabble or a jigsaw puzzle. She liked the TV game show Jeopardy! too. She and her son Michael liked it so much they used to watch it together—via telephone. She was at her house and he was at his house and they shouted out the answers over the phone to each other. After her family, Lou Ann’s other passions were newspapers and baseball. She wrote columns for several small newspapers in Kansas, including the Dodge City Daily Globe and the Bonner Springs Chieftain, where she wrote a weekly column called “Snooping with Lou.” She worked as a newspaper advertising sales and layout expert until she was 80. She had worked for several advertising companies and had contemplated an earlier retirement, but she kept hanging on to her own advertising business, LA Carmean & Associates, which she operated from her home’s basement with the help of her youngest daughter, Pamela. As an adult, she returned to school to earn her high school equivalency diploma and an associate’s degree from Longview Community College in Lee’s Summit, Missouri. 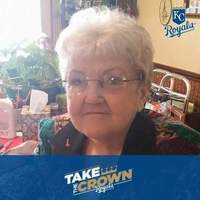 Being a columnist at the Chieftain led Lou Ann into the inner circle of her favorite baseball team, the Kansas City Royals. With permission from the Royals in 1969, she wrote a “Royals Recipes of the Week” column. She collected recipes from the wives, sisters, and mothers of the players. At the end of that season, the wife of the Royals’ manager, Joe Gordon, suggested to Lou Ann that the recipes could become a book. Lou Ann wrote six Kansas City Royals cookbooks (1969, 1970, 1972, 1974, 1976 and 1980). Proceeds from the cookbooks were donated to the National Multiple Sclerosis Society, and later to Wonderland Camp, a camp on the shores of Lake of the Ozarks for people with disabilities. In gratitude, the Royals made sure Lou Ann had free season tickets and choice seats right behind home plate with the families of the ball players. It was the perfect spot to see her favorite Royals player, first baseman John Mayberry, bat left-handed and to fill in her own scorebook. Lou Ann was diagnosed with MS while still raising her family. Later she was diagnosed with bone marrow cancer. At times she couldn’t walk and had to rely on a wheelchair. Sometimes she couldn’t talk and her children had to use sign language to communicate with her. Other times, the windows at home had to be covered with dark curtains because the light hurt Lou Ann’s eyes. Her daughter had to wrap a sponge around a spoon so Lou Ann could hold it. But she never slowed down. She spent part of some summers at the Mayo Clinic for therapy. One summer, upon returning home, she was able to walk far enough with crutches to get to the family car and drive herself to get a driver’s license without telling her family. On the day the Kansas City Royals chose Lou Ann to throw out the first ball, she could only walk with leg braces. She couldn’t make it to the pitcher’s mound, so she hung on to the fence and threw the ball just a short way to Royals catcher Ellie Rodriguez. The royal treatment from the Royals didn’t stop there. The team donated a private viewing suite atop the stadium for her when she was hospitalized. She arrived at Royals Stadium in an ambulance with an IV in her arm. She was accompanied by a doctor and a nurse, but ended up sleeping through the entire game. Lou Ann was preceded in death by son Michael Giles, daughter Nola Jean Giles, mother Johnnie Ezell, father Vernon Bragg, brothers Arron E. Bragg and Nolen G. Bragg, and sister Joye Bragg Snyder. She is survived by daughters Pamela Johnson (husband Jimi Johnson) and Rexanne Carmean (husband Randy Mueller) of Independence, Missouri; grandchildren Kelli Kellinger, Monica James, Wayne Giles, and Mike Giles; great-grandchildren Justice Salyer (husband Kanyon Salyer), Dylan James (wife Stevie James), Krystal James (husband Matt Marlow); and seven great-great-grandchildren. Survivors also include sisters Wanda Bragg Godwin and Nonnie Ezell Nutting, and many nieces and nephews. Services are at 10 a.m. on Wednesday, April 17, 2019 at Speaks Suburban Chapel in Independence, Missouri. Memorial donations may be made to the Alzheimer’s Association. To send flowers in memory of Lou Ann Carmean (Bragg), please visit our Heartfelt Sympathies Store. Consider providing a gift of comfort for the family of Lou Carmean by sending flowers. We encourage you to share your most beloved memories of Lou here, so that the family and other loved ones can always see it. You can upload cherished photographs, or share your favorite stories, and can even comment on those shared by others. Provide comfort for the family of Lou Ann Carmean (Bragg) by sending flowers. Rexanne, Lee Ann and I send Our Love and prayers. Sorry for Your loss. I miss those Christmas cards that always came with little surprises inside. Hope You are doing well. God bless You and Yours at this difficult time Cliff Minks. For the best adopted Gran we could have ever wanted. We didn't get nearly enough time with you, but your memory is forever ingrained in our hearts. You will forever be loved and missed. Forever Royal!